The Elders Gathering is a weekly event that happens every Tuesday as part of our Roots of Happiness: Elders Health and Wellness Program. 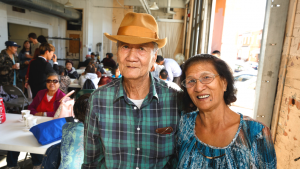 From 9am-11am, local South Philly Elders of Bhutanese, Lao, and Vietnamese descent gather at Bok to enjoy breakfast and fun activities, such as chair yoga, painting, holiday parties, etc. We also provide health screenings, such as glucose and blood pressure testing, courtesy of Jefferson Health.